Dietary guidelines released by the USDA recommend that you make grains a part of your diet, and both rice and bread contribute to your daily intake. A cup of cooked rice, or 2 ounces of bread -- the approximate equivalent of 2 slices -- boost your grain intake by 2 ounces. The USDA recommends that you get the majority of your grain intake from whole grains, and choosing whole-wheat bread and brown or wild rice over white bread or rice allows you to follow these guidelines. Both rice and bread offer nutritional value, and provide beneficial carbohydrates, but they offer different amounts of micronutrients. 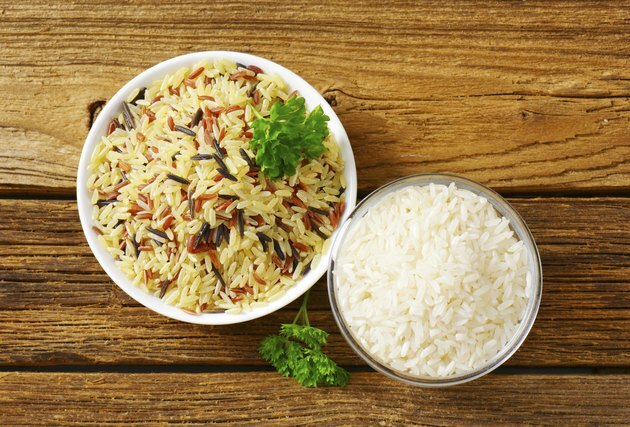 Whether you choose bread or rice, you'll boost your carbohydrate intake. Your body uses carbs as a source of sugar, which your cells convert into energy. A 2-ounce serving of whole-wheat bread contains 25 grams of total carbohydrates, while 1-cup servings of brown and wild rice contain 45 and 35 grams, respectively. Whole-wheat bread, brown rice and wild rice also contain significant amounts of dietary fiber, or 3.9, 3.5 and 3 grams per serving, respectively. Choosing either food helps you reap the benefits of meeting your daily recommended fiber intake of 38 grams for men and 25 for women, which include healthy digestion and lower blood cholesterol levels. Reach for rice, particularly brown rice, as a richer source of magnesium, compared to bread. A 1-cup portion of brown rice offers 83.9 milligrams of magnesium, which contributes 20 and 26 percent toward the daily intakes recommended for men and women, respectively. A serving of wild rice, in contrast, contains 52.5 milligrams of magnesium, while bread contains even less -- 46.7 milligrams per serving. Your body relies on magnesium to make lipids and DNA, as well as to regulate your hormone balance and support cell communication. Choose bread over rice and you'll consume more iron. A 2-ounce portion of whole-wheat bread contains 1.39 milligrams of iron, which is 8 percent of the daily iron intake recommended for women and 17 percent for men. Wild and brown rices, in contrast, provide 0.82 or 0.98 milligrams of iron per serving, respectively. Bread's superior iron content means that it better helps your body transport oxygen, and its iron content also helps with short-term oxygen storage within your muscles. Brown rice -- but not wild rice or bread -- provides a significant amount of vitamin B-5, or pantothenic acid. Your cells incorporate vitamin B-5 into coenzyme A, a chemical involved in your metabolism. Coenzyme A also helps maintain brain function, aids in oxygen transport and helps you synthesize hormones. A serving of brown rice provides 556 micrograms of pantothenic acid, which makes up 11 percent of your recommended daily intake. Wild rice's 253 micrograms and whole-wheat bread's 391 micrograms of pantothenic acid fail to provide at least 10 percent of your recommended daily intake. USDA ChooseMyPlate.gov: How Many Grain Foods Are Needed Daily? USDA ChooseMyPlate.gov: What Counts as an Ounce Equivalent of Grains?